Hello fellow crafters and bloggers, I'm back in the challenge mood and this challenge is running over at Charisma Cardz I am inclined to put too much on a card and this challenge was an exercise in 'less is more' for me. Not too bad methinks. Charisma Cardz have a group on Facebook which you can apply for membership. Lots of other crafters sharing ideas, chat and great fun. 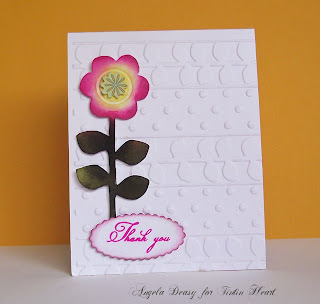 I made the card by embossing the white cardstock base with the large folder from the Sizzix 'Spring' set. The flower is from the same set, embossed on to white cardstock and coloured using Forest Moss, Dandelion and Cheery Pink inks and then cut out. The sentiment is from a Papermania stamp and cut using the Nestabilities scalloped ovals die. Thanks for stopping by and don't forget to leave a comment, I love hearing from you. Lovely card...great use of the negative space with that embossing. Thanks for joining us this week at Charisma.